Subject line: do not write "Help" in your title. Everybody needs help, so you don't need to add that. Subject line: no ALL CAPS titles or posts. It's shouting. Don't shout. Subject line: no funny/special characters in titles to get attention, please. Don't ask for people to reply to your email address. This is a forum, not a mailing list, plus you can get email notifications to responses anyway. Don't hijack a topic. If you have a question that isn't directly related, start a new topic. Please do your best to write readable English. Try to spell things correctly. No "texting" lingo. Common Web acronyms are ok. Written text is the only form of communication we have. Do not post the same thing in multiple forums. We will delete duplicates. No politics, profanity or religion in posts, signatures or usernames, please. Please follow up. A day, a week, a month, it's ok - just let us know how it turns out. Start sentences with Capital letters. This is a technical community with highly skilled members. We need to keep the level of discourse at a reasonably understandable level. Think about it: others are more likely to respond to your question if you ask it clearly. I've been running this board for well over a decade. Well-phrased questions get more answers. Writing is all we have, save for the occasional but very helpful(!) photo/video. If English is your 2nd/3rd/4th language, you are not held to this standard. Last edited by matthew1 on Wed Mar 15, 2017 4:34 pm, edited 1 time in total. I am probably guilty of this because I am not from an English speaking country - I'm from Australia where we speak 'Aussie'. I agree with this subject, and will pay particular attention in the future. G'Day mate! That sh*t irritates me to no end. My 12 year old daughter doesn't even communicate like that. And please don't use shorthand. Make complete sentences; don't use things like 'u', 'bro', 'lol', connect sentences with '...', or drop f-bombs every 5 words. That doesn't belong on a technical forum out in public. Some posts lately have been getting seriously annoying. Most of us are older than 16 here, so act like it. We're not texting our friend, and I don't even write like that in text messages. If I get a message like that from someone, I'm not even going to answer. If you're posting an actual question, don't post something like "car won't start" as a title and then "what could be the problem?" as the actual text. Seriously? If you want an answer, give members some actual symptoms to work with or do some research yourself for possible causes before asking a question that could be any number of things. Hi, I have a 1994 850 Turbo with ~170K miles and a lit ABS light. I found this site and, using the very helpful repair database, I pulled the codes from under the hood. From A3 I get DTC 443 "Pump Motor Electrical or Mechanical Fault". Searching around a little more, it looks like the ABS module in pre- '96 cars rarely fails. But, my understanding is the hydraulic ABS pump has been known to leak in '93-'94's. Is there anything else I should check or test before replacing the pump/motor assembly? I don't see any obvious leaks, and the wiring between the ABS control module and pump/motor seemed to look OK (no visible deterioration of sheathing, or loose wires). At ~$1,000, a new pump/motor assembly isn't really an option for me. Is it worth trying a used unit? Any tips or instructions for the replacement, is this a manageable DIY repair? Polite, cordial, and proper English - he did some real research before asking a question. There are a lot of many polite, helpful people on the board that will be glad to help you if they can understand what you're asking, so please respect everyone by doing this little favor for all of us. We (Matt and us moderators) are at a bit of a loss about what to do about some of those posts that have been coming up lately - so this is an attempt to help address the issue before it gets too far out of hand. I have been researching forums relating to the issues with my recently aquired vehicle for a few months now. I must say, I respect this forum for the professional feel. I understand some issues are new to myself and I may post a question hastily, lacking due research. Thanks so much for the resource, and occasionally I may even be of assistance. I understand, and am enjoying the exchange. I've been holding this back for some time but feel it is appropriate with this subject matter: quit the rudeness!!! (you know who you are!). I am a 46 (soon to be 47) year old man and the last thing I need to read is a reply from some ignorant "you know what" wanting to show off his knowledge by being rude and obnoxious. Trust me, you're not impressing anyone with it. If in fact you do have knowledge or relevant info to share, it is overshadowed with your rudeness. Take that ignorance to the many other car forums online that allow that crap! I come here to share my knowledge, give input (when applicable), ask questions, and offer any help that I can. I don't come to this forum for ignorant and rude replies from anyone. If you don't agree with someones answer and you don't know how to express your opinion in a professional and respectable manner then don't say anything at all!!! Spare us your misery! As the old saying goes: "if you don't have anything nice to say, don't say anything at all". Last edited by bronxnativ on Sun Dec 04, 2011 8:42 am, edited 3 times in total. Don't worry, even the best American English is near-gibberish compared to actual English. Listening to it is even worse. This is a very good subject, thanks for addressing it. Keep in mind this is an international forum with native and non-native English speakers, whether you like it or not. 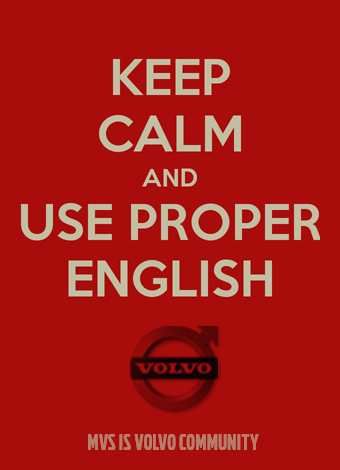 The non native speakers are learning not only about their Volvos but English as well. I have been in this country for a few years but I still do no speak or write perfect English (thank God for spell checker that is not always perfect) but sometimes my jaw drops when I see that much Ebonics.